A Gentleman in Moscow immerses us in an elegantly drawn era with the story of Count Alexander Rostov. When, in 1922, he is deemed an unrepentant aristocrat by a Bolshevik tribunal, the count is sentenced to house arrest in the Metropol, a grand hotel across the street from the Kremlin. Rostov, an indomitable man of erudition and wit, has never worked a day in his life, and must now live in an attic room while some of the most tumultuous decades in Russian history are unfolding outside the hotel’s doors. Unexpectedly, his reduced circumstances provide him a doorway into a much larger world of emotional discovery. Brimming with humor, a glittering cast of characters, and one beautifully rendered scene after another, this singular novel casts a spell as it relates the count’s endeavor to gain a deeper understanding of what it means to be a man of purpose. Interested in reviewing and discussing intriguing contemporary fiction and nonfiction books on a variety of topics? Then you’ll love our Adult Book Club! Join us as we explore books of all kinds—contemporary fiction, special interests, current and past affairs, fun trends, memoirs, etc. 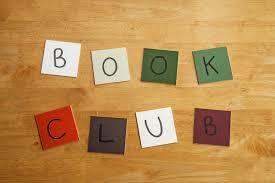 The purpose of the Thursday Book Club is to offer readers a fresh approach to the traditional book club. Copies of the Adult Book Club book selections will be available at the library and to order. Reserving a copy is highly recommended. Book discussions will be held the last Thursday of the month. Call (964-2020) or drop by for this month’s selection. We look forward to sharing a reading adventure with you!